FIFA’s ace up its sleeve has always been its licenses. With EA’s deep pockets bankrolling everything including league and player licenses, well-known commentators, official sponsors, and real-world brands, the FIFA franchise has always been the go-to place for the most authentic representation of world football. Traditionally, this has come at a cost to gameplay, but in the last few years a concentrated effort to develop the on the pitch aspect of the game has emerged – and to great effect. FIFA is now, without question, the most popular soccer game on earth. You could even make the argument that it’s the most popular sports game in the world (although in America a certain pig-skin franchise still reigns supreme). So with that in mind, the pressure on FIFA 13‘s publisher EA and developers EA Canada to continue to build on FIFA’s momentum — not just in terms of popularity, but in quality — can’t be understated. And with Konami’s PES 2013 making massive strides this year and upping its own game, FIFA 13 needs to be more than just good – it needs to be great. Simply put, FIFA 13 is an excellent soccer game. Without question the bulk of that excellence takes place on the pitch. Last year developer EA Canada took a big gamble and implemented a much more robust and user-controlled defending system. The responsibility of positioning your defender, implementing man to man pressure, and tackling were all given to the player. While it was initially difficult to adjust to for series vets such as myself, there was no denying that it breathed new life into an aspect of the series long ignored, and perhaps more importantly added another layer of realism and strategy. This year EA has added even more nuance to FIFA 13’s mechanics, but instead of there being one large new introduction in the vein of last year’s Player Impact Engine, this year we are given a slew of improvements that help shape a much more realistic game. For starters, the ball physics and how they interact on the pitch and with players has been revamped; balls no longer feel magnetic or on-rails and exhibit a much more unpredictable character. Deflected shots now ricochet properly, and players no longer get sucked directly to the ball like a giant tractor beam. Speaking of the ball, how it reacts to the players has changed a great deal for FIFA 13. Past FIFAs have always seemed to place players on a level playing field in regards to things like ball control. Send a long pass down the field and any player, regardless of whether they play for Real Madrid or Real Salt Lake, can control and trap it with dazzling ease. This is far from how it is in the real world, and EA Canada has wisely done away with this for FIFA 13. Now players trap, control, and move the ball around like they actually would — which means you should expect just as many clumsy touches and awkward passes as you would brilliant ones, but also expect to utilize Andres Iniesta’s serpentine-like dribbling skill and Cristiano Ronaldo’s blistering pace to your advantage. It might seem frustrating at first, but the effect this has on gameplay and tactics cannot be overstated. FIFA 13 requires you play to your teams’ strengths. So for Barcelona, a possession-centered game with intricate passing; for AC Milan, well… we don’t really know what Milan is doing these days, but you get my point. Another tweak to the gameplay comes by way of FIFA 13’s Complete Dribbling system. If you’ve played FIFA Street earlier this year you’ll be familiar with Complete Dribbling. For 2013, EA Canada basically yanked the mechanic from the Street franchise and plopped it right into FIFA 13. It works really well and provides the ability to navigate tight spaces with greater precision and control. FIFA 13 also feels like a much more physical game, with the size, weight, and position of your player mattering now more than ever before. While you’ll be able to create a great deal of space and slither by defenders with Arsenal’s Santi Cazorla, or distribute the ball around as Xavi with laser-like accuracy, don’t expect the same amount of freedom with the likes of Peter Crouch and John Terry. Instead, the games demands a higher degree of tactical awareness, so if you’re trying to muscle your way past Vincent Kompany with the likes of Lionel Messi expect to get shoved off the ball every time. But more than anything else, the improvements made to your teammate’s AI is what will have you singing loud into the rafters long after you pop the game disc in. 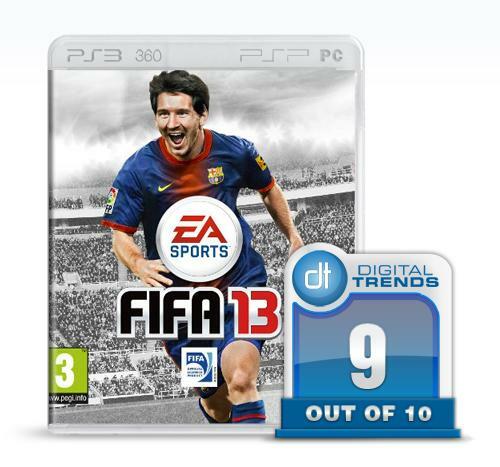 In FIFA 13, players make intelligent runs and do so without requiring your command. What’s more they actually attempt to stay onside! Keeping possession and passing the ball around is now much more effective, and the ability to deliver that perfectly timed through ball to an industrious attacker brings forth a feeling of joy and accomplishment. Altogether you feel more like you’re surrounded by a living, breathing team who share the same goals as you: winning the match. It’s clear EA Canada spent a great deal of time trying to get the fluency, subtlety, and realistic characteristics of the beautiful game into FIFA 13, but some issues do creep up. Crossing this year seems much less forgiving, but if you are feeling generous that could be chalked up to the improved (read: more realistic) physics. On the pitch play has a tendency to feel a little too fast at times, especially in comparison to last year’s outing, as well as the recently released PES 2013. It’s not a deal-breaker by any means, but it’s certainly palpable. Where FIFA seems to have gotten the least amount of love and attention is in the graphics department. Visually, FIFA 13 isn’t all that different from FIFA 12. Sure it looks sharper, is more polished, and features some nice new contextual animations, but it’s by no means the highlight of the show. And that’s ok. But where I feel compelled to call FIFA out is with the seemingly lazy manner it presents some of the top footballers around the world. And really it’s been doing this for years now. While some players are spot on and represent their real-life counterparts with almost photorealistic accuracy, many of the game’s established superstars, like Clint Dempsey, Leonardo Bonucci, Oliver Giroud, and Mirko Vucinic, look awkward and lazily done. It might not be as visually polished overall, but in comparison to PES 2013’s character models, FIFA lags behind its rival. What should come as no surprise is how much FIFA 13 excels and manages to best its past editions in the presentation department. Martin Tyler and Alan Smith return for commentary duty alongside Clive Tyldesley and Andy Townsend, while newcomer Geoff Schreeves provides touchline injury reports. For FIFA 13 EA has tried to make use of its partnership with ESPN, with the beginning of the match taking on a more “televised” theme, and the ESPN name used to some degree similar to the other EA Sports games. It isn’t done with a great degree of enthusiasm though, and seems like it was more of an afterthought than anything else. It would be nice to see the FIFA series take advantage of its ESPN license similar to how the Madden series does. And while it doesn’t detract from the presentation it doesn’t really add anything to it either. As for content, there is a lot to be had in FIFA 13. In addition to the popular pokemon-esque Ultimate Team mode, Be A Pro mode returns alongside a revamped Career mode. Here you have the choice of either steering your team to promotion or top-flight success as club manager, or battling it out on the pitch as a budding talent in an effort to lead your club to glory. New this year is the ability to get called up to the national team as a player or coach, adding another layer of drama and determination to you weekly matches. Interestingly my season campaign began with a bit of whimper. I took the reins of a player looking to break into Arsenal’s first team. After being given a chance to shine in a few pre-season friendlies, the gaffer felt my time would be better spent out on loan in a lower division. After denying a few teams my obviously overlooked talent, I finally settled on a Bradford City and eventually guided them to first division promotion with my midfield performances rivaling that of an orchestra conductor. Needless to say that caught the eye of the footballing world, and I was duly called back to Arsenal and given a place on the U.S. national team. In addition to a more drama-filled career mode, two key additions make their way to FIFA 13: Skill Challenge and Match Day. The first is a series of challenges ranging from simple dribbling skills to free kick practice. On top of being able to tackle these one by one from the main menu, you’re also given the opportunity to complete one before each match begins. There are different levels ranging from bronze, silver, and gold, with difficulty naturally progressing for each subsequent level. The second introduction adds the greatest amount of depth and longevity to the FIFA experience. With Matchday FIFA 13 attempts to keep up to date with the happenings and goings of the season. That means team lineups, formations, and player form are all tracked from what its taking place in the real world and accurately transports it to the game. It’s a very small, but far-reaching introduction that will keep gamers happy, as the mid-season form of players and the shuffling of rosters around the winter break tend to alter the landscape a great deal. Truthfully, FIFA has never had difficulty keeping players coming back for more footie fun, but little touches like this really do a lot to keep the game fresh and up to date, especially considering the ephemeral nature of world soccer. Of course, if you’re team ends up plummeting down the league table you might not be so inclined to mimic that in the game, so thankfully FIFA 13 allows you to play with Matchday turned off. Another new feature is EA Sports Football Club, which serves as an online shop of sorts. Here you earn rewards, unlock items such as new boots, old-school kits, and other player-related swag. Building up your virtual currency is as easy as completing skill challenges and playing matches. It’s nothing groundbreaking, but will keep players busy throughout the course of the year as they strive to reach the 100 levels and nab all the game’s unlockables. Another staple of the FIFA series is its online play. There aren’t really many new editions this year, only refinements. Online Pro Clubs implements the excellent online season mode setup, so taking your virtual club online with 10 other buddies makes for a much more interesting affair. Generally, EA does an excellent job managing and maintaining the online experience. Thus far I haven’t really encountered many online glitches or issues, although there is a tendency for the matchmaking to lose connection frequently, but I imagine this will be ironed out over the next few months. The time I did manage to spend in game was smooth. Some noticeable lag crept up, but otherwise online matches behave themselves and offer a never-ending array of human opponents to demolish or succumb to. There isn’t much more to be said about FIFA 13, EA Canada has delivered in style and a midst a growing amount of hype. FIFA 13 doesn’t provide that groundbreaking leap FIFA 11 did, but it does build on the changes implemented to last year’s effort and continues EA’s dominance in the soccer arena. It doesn’t really blow its competition out of the water, but FIFA 13 is better in virtually every way from FIFA 12, and for gamers (and FIFA fans) that’s really all that matters.